After over 20 years of international climate change negotiations, talks continue to move further away from identifying the root causes of the climate crisis. These short, sharp articles highlight years of struggle, passion and commitment towards environmental, social and climate justice. The writings found in this booklet are contributions from committed activists, researchers, scholars, feminists and thinkers who participate with wide networks of dynamic peoples and groups. They continue to push the limits in the quest towards global justice. 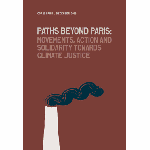 This Climate Justice Compendium attempts to address the root causes of climate change beyond the fallacy of the climate negotiations and towards building international solidarity.